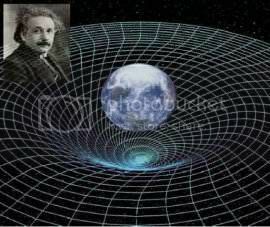 Is Earth in a vortex of space-time? We'll soon know the answer: A NASA/Stanford physics experiment called Gravity Probe B (GP-B) recently finished a year of gathering science data in Earth orbit. The results, which will take another year to analyze, should reveal the shape of space-time around Earth--and, possibly, the vortex. Time and space, according to Einstein's theories of relativity, are woven together, forming a four-dimensional fabric called "space-time." The tremendous mass of Earth dimples this fabric, much like a heavy person sitting in the middle of a trampoline. Gravity, says Einstein, is simply the motion of objects following the curvaceous lines of the dimple. I think this was one of the early confirmations of relativity. Mercury's orbit precessed about 43 arc seconds per century more than could be explained by Newtonian physics. Einstein's new model said that that the extra was due to the twisting of space. Does this phenomenom also apply to closer objects to the sun? Regular comets and other debris should also show some of the same perhaps. You are right, Joe. In fact, the effect would be more pronounced as you got closer to the Sun because it's gravity, and therefore it's space-time distortion, increases with the square of the distance. At half the distance to the Sun as Mercury's orbit, the gravity would be four times as much.